What’s next for Anthony Calvillo? Calvillo was one of the Als players at the Bell Centre Saturday night, the guest of team owner Robert Wetenhall, to watch the light-heavyweight boxing match between Jean Pascal and Lucian Bute. Instead, the only uncertainty regarding his future is whether he plans on immediately launching a coaching career. 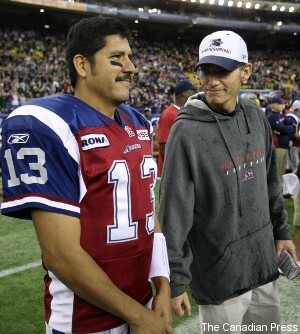 The Gazette has learned Calvillo was offered the Als’ offensive coordinator’s position for next season, but declined. That could mean he doesn’t believe he’s ready to assume a coaching position with that much authority. Or more than likely, following two decades playing professional football, Calvillo could simply want to enjoy summer for the first time and wants to take a step back from the game to reassess his future. When he’s ready to coach, there undoubtedly will be a position awaiting his arrival in the Als’ organization. But, should Calvillo want to venture south, Chicago Bears head coach Marc Trestman would assist in the scenario — if not with the Bears directly, some other team. Trestman, who coached the Als for five seasons, invited Calvillo to the Bears’ practice facility last spring to mentor Jay Cutler and the team’s pivots in Trestman’s offence. It's unfortunate to see Calvillo's playing career end on such a down note, but if he elects to return to the game as a coach at some point, he could be a valuable asset to any organization. Calvillo's seen a lot of different offensive and defensive schemes over 20 seasons in the CFL, and while some NFL teams might be reluctant to bring in someone with no NFL experience, it's notable that Calvillo almost wound up there with the Pittsburgh Steelers; there's no guarantee he would have been an NFL success, but it was timing and circumstances that kept him out of that league, not a lack of ability. Calvillo demonstrated both great technique and a terrific ability to read defences throughout his CFL career, and if he can pass any of that on, he might be a terrific quarterbacks coach or offensive coordinator. We'll see where he winds up, but while his playing days may be done, there may be new chapters still in Calvillo's football story.